However, this was probably the closest thing to a solid piece of beeswax I would be able to find on short notice so I bought some. After all, beeswax is used to make candles, so it melts easily and can be moulded into a different shape. For the next bit of this post I should probably add the disclaimer that you should not try this at home. 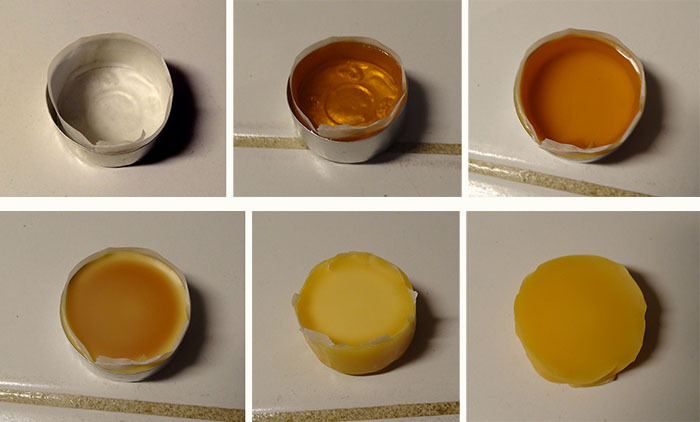 Melting beeswax seemed like a great idea, but how do you do that? At first I thought of melting it au bain marie but I didn’t want to use any of my kitchen bowls because I want to be able to continue using those for food preparation purposes. 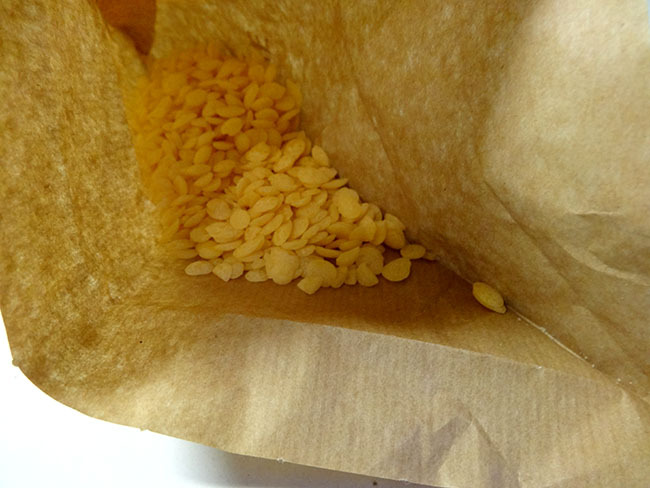 A Google search on “melting beeswax in the mircrowave” quickly cured me of that idea. In the end I put the beeswax in a jam jar and started holding it over boiling water with a serving thong. This did not work all that well because the thong did not have a very good grip on the jar. To be honest, this part probably was slightly dangerous. Instead I placed the jar in hot but not boiling water and moved it around a bit with the thong. 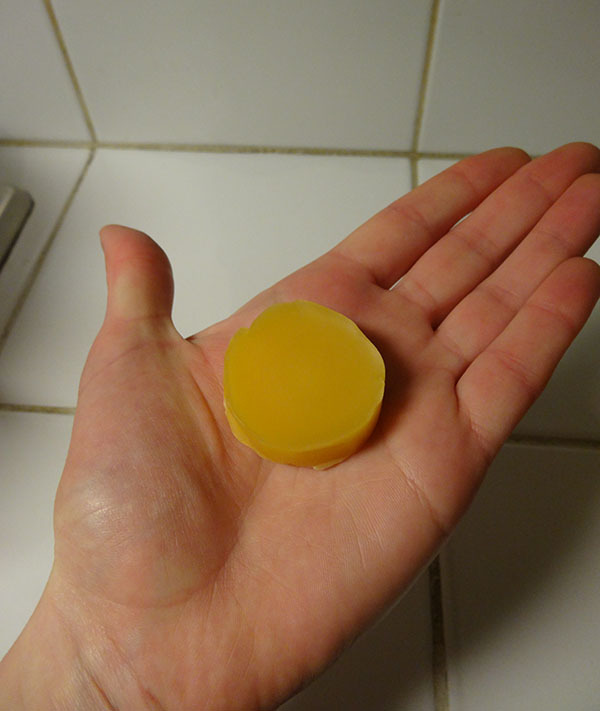 The beeswax melted quickly and as soon as it was ready I put on oven mitts to protect my hands and poured it in a mould I had prepared before. For the mould I used a waxine light cup that I lined with baking paper. Some of the beeswax ran below the paper but I could quite easily coax the piece of wax out after it had cooled so perhaps the paper wasn’t even necessary. With 2015 already in its third month (I can’t quite believe that, where did January and February go?) it’s about time I start thinking about my sewing plans for this year. We’ve moved into our new home and life is slowly starting to get back to normal. I’ve even been sewing again! My new sewing room is great to work in. It’s huge with good natural light during the daytime and a lot of storage space. The latter I have to admit is currently still quite disorganised which can make it difficult to find what I need. This year I am going to continue to make my own clothes, but I’m not going to stress about it. Not that I did that last year anyway. In 2015 I’d like to challenge myself a bit more in the sewing department, try more new techniques, different fabrics and more complicated patterns than I did during 2014. This year also comes with more special occasions requiring special clothes, which could make things interesting. I’ve not done a lot of crochet after finishing my scarf (that I am still wearing!). It turns out that granny squares aren’t really my kind of project. A real garment is what I’m now after. I still need some help with crochet as this is a skill that doesn’t come natural to me so I bought the “my first crochet cardigan” class from Craftsy, I also got the yarn kit that came with the class so that I don’t have to worry about getting the correct yarn for this project. I’ve already made a gauge swatch with the recommend hook size which turned out pretty but way too small. Apparently I crochet tight. I have ordered more crochet hooks in other sizes and will continue my crochet garment quest when those arrive (I’m hoping soon!). Did you make a plan this year for the things that you would like to make?